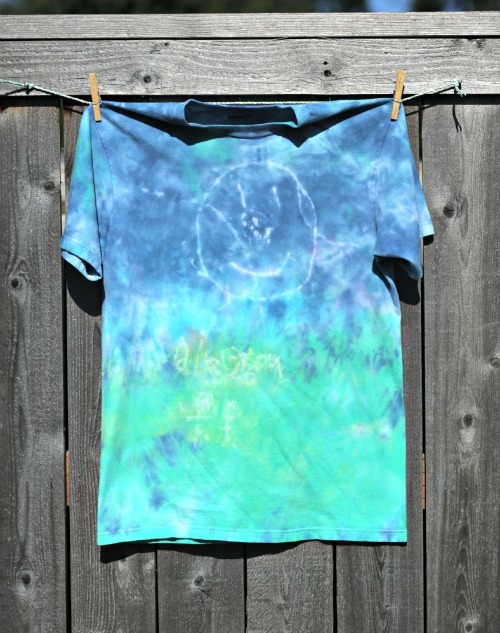 If I could, I would put kid drawings on all the things, so when I learned that I could use Tulip Tie Dye Resist to create unique patterns and designs on a tie dyed shirt, I decided to put my boys to work creating one-of-a-kind t-shirts for Dad for Father's Day! 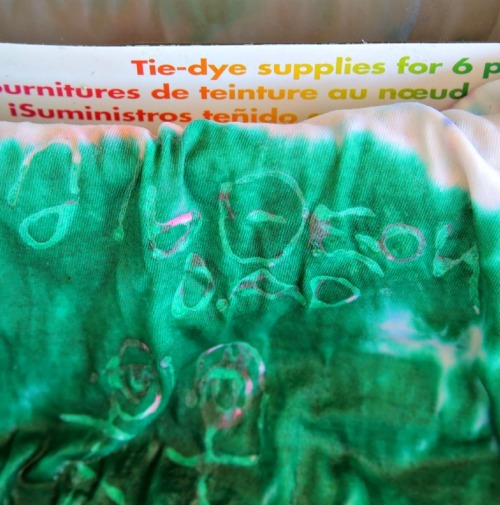 Tie Dye Resist is easy to use, but I found some tips for using it with kids. 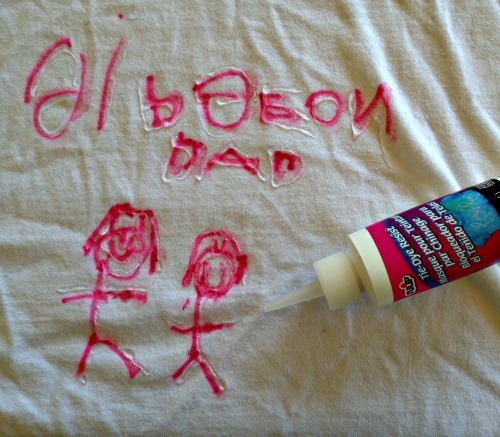 Read on for how to make kid art t-shirts for Father's Day! 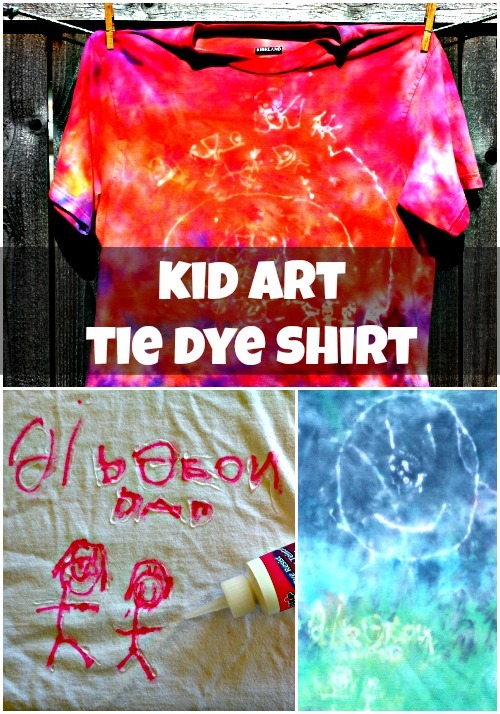 Step one: Have older children draw on the pre-washed and dryed t-shirt directly with the Tulip Tie Dye Resist, and allow glue to dry for several hours. 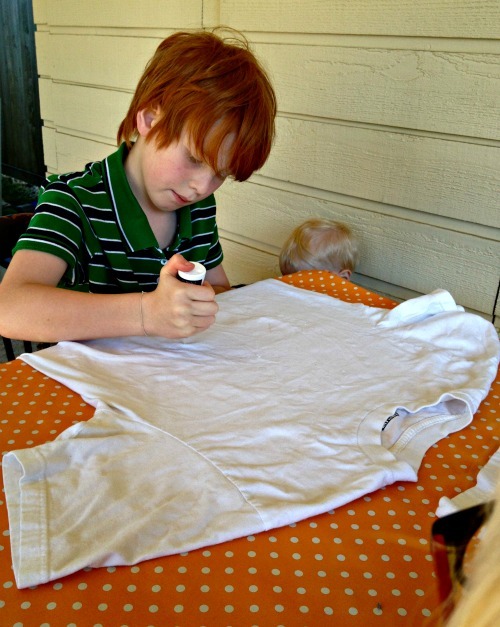 Have child draw on t-shirt with washable markers. Note, these are NOT fabric markers, but the type you use for school. 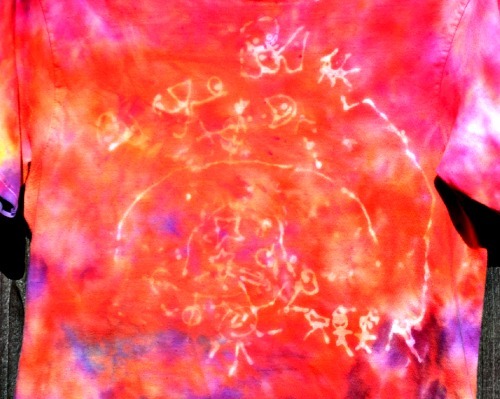 Next, once the child is done drawing, go over the drawings yourself with the Tie Dye Resist. Because it can take a bit of hand strength to squeeze the glue and draw accurately, this might be the best way to go. Allow glue to dry for several hours. Dampen the t-shirt and wring out. 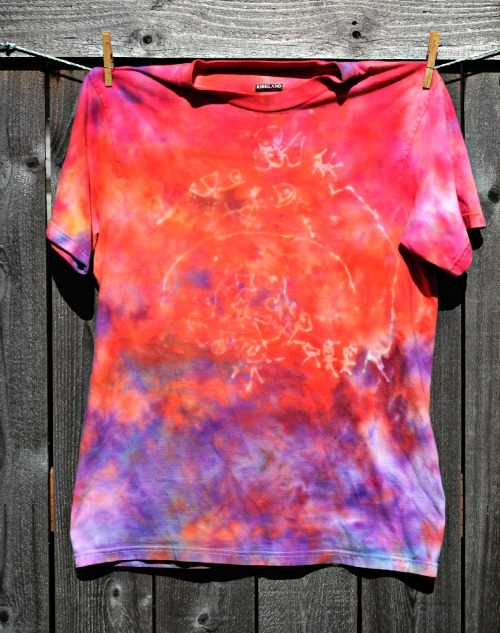 Put the shirt in the plastic bin and squirt dye all over the dry drawings. 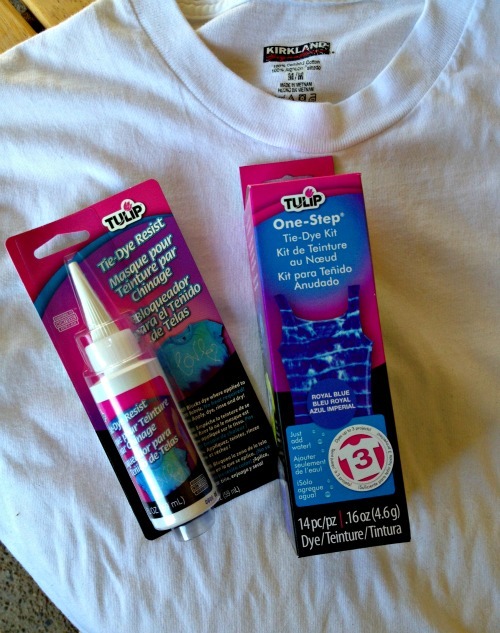 For these shirts, I just squirted dye all over the t-shirts and avoided any tying or twisting. Put dyed shirt in a zip-top bag (a quart size bag is good for an adult t-shirt), and let it sit for at least 6 hours. Rinse and launder according to package directions. 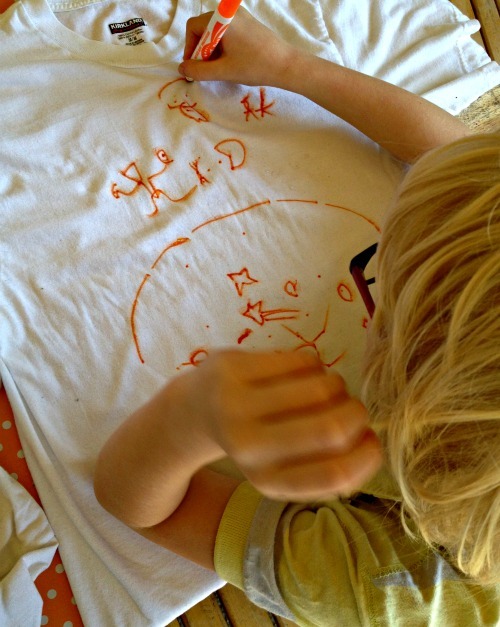 All the resist (and the washable marker) will wash out in the washing process, leaving a lighter area where the child's drawings can show through! The drawings won't be perfectly white, but will be lighter than the dyed area. The thing I love about these shirts is that they are custom kid designs, but they look cool and stylish. They would make great Father's Day gifts, but also a good gift for Grandparents Day, or for a kid to make for him or herself! I wonder if it would work for hand or foot prints. Could you brush on the glue in that case? @minilibby yes, I think that would work. I was also thinking it might work to trace a hand on a sponge & cut it out.